HAVE you ever noticed that you stay on some websites a lot longer than others? To market your brand and business, you need to elevate your copy so readers love to interact with your website. The most loyal customers will anticipate each blog post you write, excited for new insights and entertainment. Although long-form copy performs well in some industries (particularly in B2B sectors), most marketers need to trim down their work. Ideally, every word on a website shines a light on the value of your service or product. Copy that emphasizes how a company can transform customers’ lives is most likely to strike a chord. If you’re not sure if your marketing copy is concise enough, take a highlighter to a printed version of your website page. Mark every word that helps your audience understand what you do, why you do it, and how your company stands out from the crowd. Leave out superfluous details, so your message can truly shine. 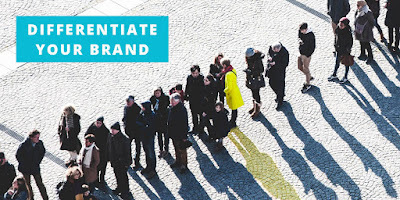 In order to create traffic, you need to understand the unique attributes you offer customers. Instead of mimicking the voice and pitch of other brands — especially competitors — write down what appeals to you about their marketing. Maybe it’s their killer Instagram account? Or their confidence in connecting with their audience? Awesome copy is an extension of a company’s brand, so also identify what makes you different from competitors. Perhaps, it’s your stellar customer service or your big community. These are the characteristics you want to identify in your copy. If you struggle to identify what sets you apart, record your voice in a smartphone describing your original vision for the company. Type it up. Next, go through the copy, and cherry pick the clearest, boldest copy to use on your website. Even if you follow these two steps, you’re still not out of the woods. Amazing copy resonates with an audience — the best way to find out if it hits the mark is to ask. To ensure you’re crafting awesome copy to your website, reach out to a batch of people who represent your target audience. They could include a set of honest friends, or loyal customers who are willing to answer a short survey. 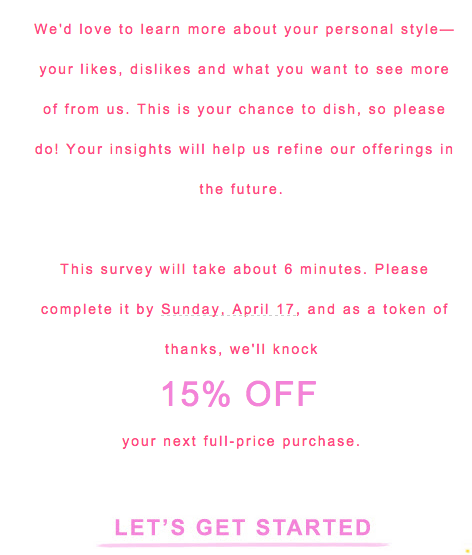 You can also offer an incentive to email subscribers, such as 15% off a future purchase for participation in the survey. For a template, consider the following survey request from the clothing and homeware shop Anthropologie — it’s a pretty stellar way to ask for help. In your survey, share some simple questions that gauge your audience’s perspective on your current marketing campaign. A simple Google Form or a free tool such as SurveyMaker will due the trick. Creating a survey with anonymous responses increases the likelihood of participation. With accurate feedback, you can gauge the extent to which you need to adjust your marketing copy. These three guidelines to awesome copy extend to social media, email marketing, and print materials too. By crafting language that resonates with both your brand and your audience, you pave a clear path toward increased traffic generation and higher sales. Tell us how do you feel about it and don't forget to share it with your friends..